NEW PRICE! SHOWING BY APPOINTMENT ONLY TO QUALIFIED BUYERS, NO EXCEPTIONS! Owner occupied. 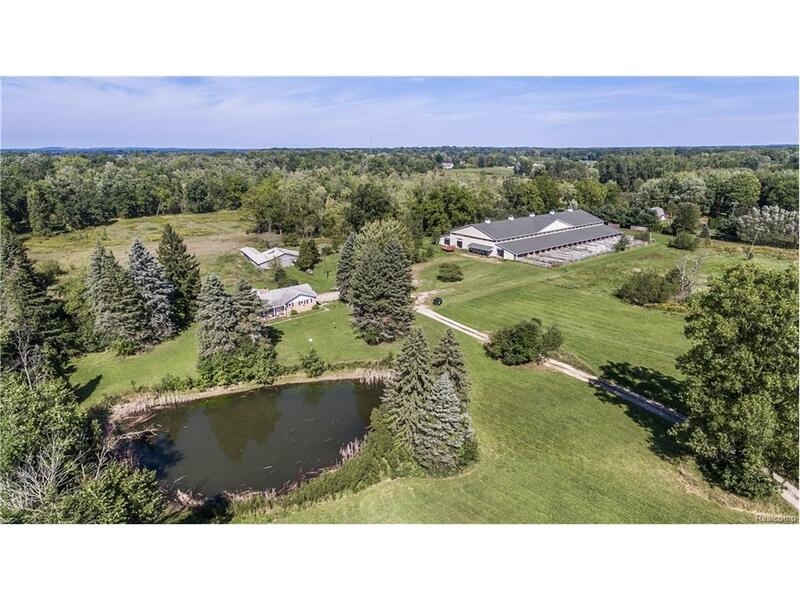 20 acre horse farm in South Lyon School District, with 28 STALL BARN that has additional room for more stalls or hay storage, an INDOOR ARENA (70 X 170) with observation room and elevated deck, a PICADERO (40 X 40 indoor square pen) great for round pen or extra hay storage, wash racks, custom tack cabinets & much more. Have your agent get list of extra features from documents section in the listing. 3 bedroom home overlooks pond. Land is beautiful with small ponds, dry pastures, trails & some wooded areas. Great potential as training/lesson or boarding operation with ideal location! Good access to US 23. 13 miles from Ann Arbor and only 37 miles to the Detroit Metro Airport. Area prepared for outdoor arena. PRICE REDUCED, and reflects need for fence and driveway grading. Additional stalls in POLE BARN, additional info in documents. Buyers to verify all information. 72 hr. notice to show. IDX provided courtesy of Realcomp II Ltd., via Mi Horse Properties and Realcomp Ii Ltd, Copyright 2019 Realcomp II Ltd. Shareholders. Real Estate listings other than those of Mi Horse Properties are marked with the Broker Reciprocity logo and detailed information about them includes the name of the listing brokers. Information deemed to be reliable but not guaranteed. Any use of search facilities of data on the site, other than by a consumer looking to purchase real estate, is prohibited. Last updated on 2019-04-24.